This Giraffe handpainted needlepoint design from The Meredith Collection C-444a features the giraffe with an African style geometric background and it would be lovely as a pillow or wallhanging. For stretcher bars we recommend 2 pairs of 19" and some thumb tacks. 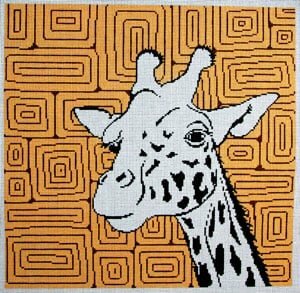 This Meredith Collection Giraffe needlepoint design usually ships within 10 days.